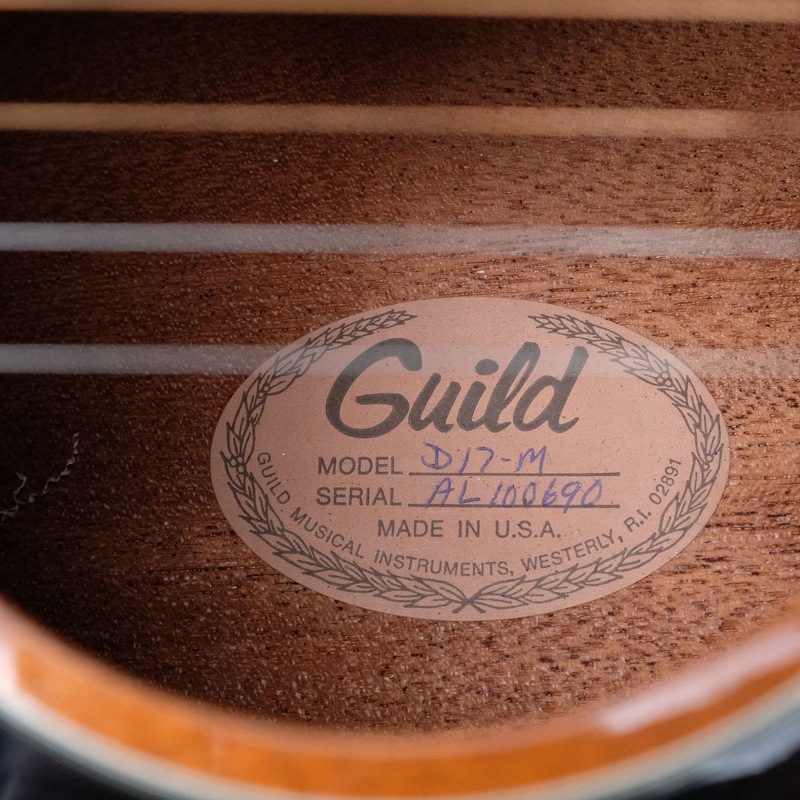 Guild D-17s are great boxes and definitely built more for the working-man guitarist. 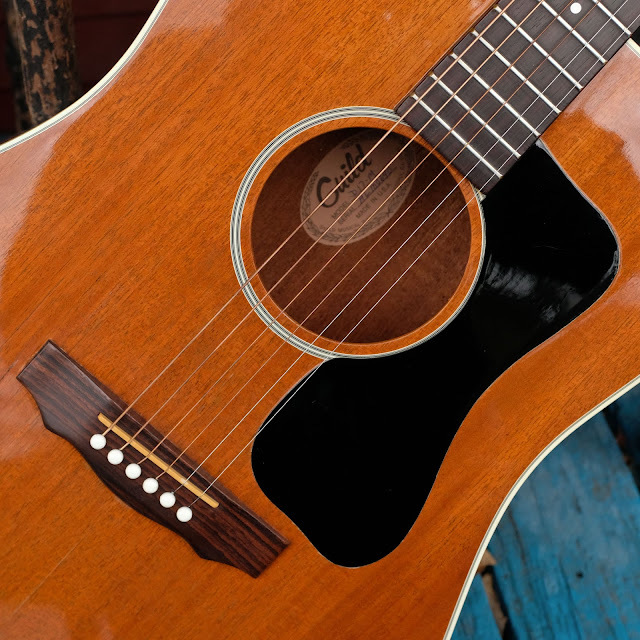 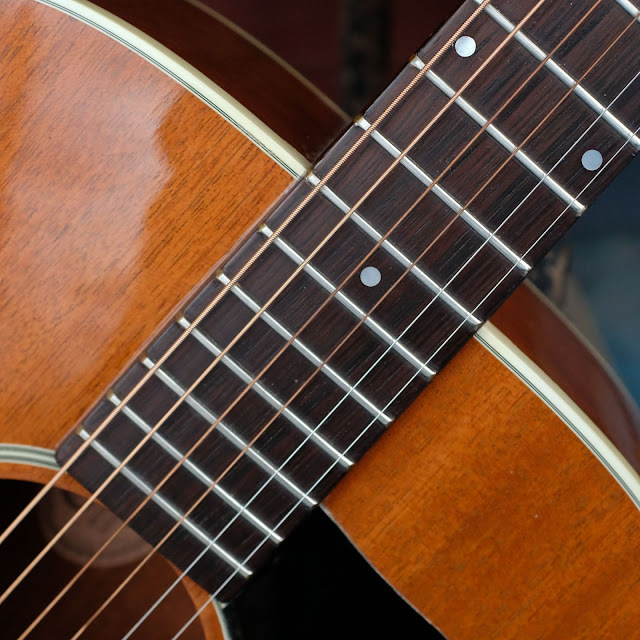 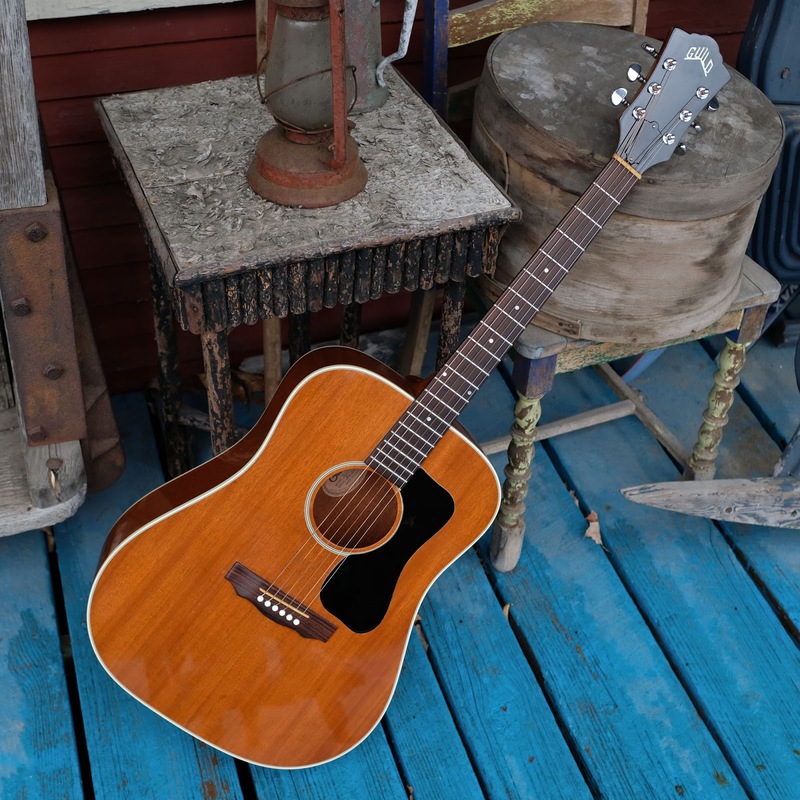 They have an arched, ply back and solid mahogany top -- both of which lend durability and extra punch to the sound. 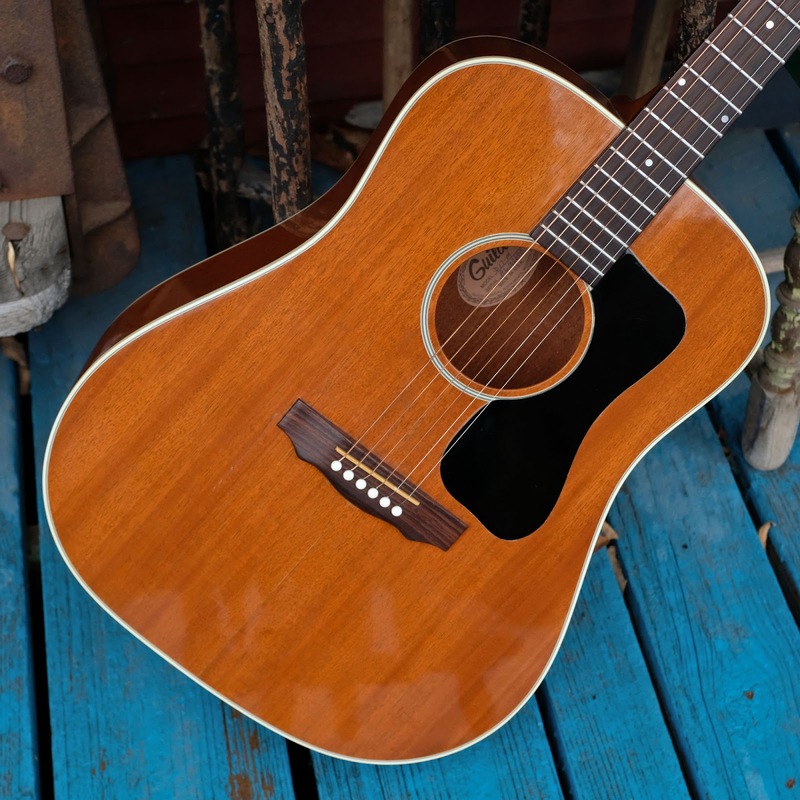 Good ones of these sound a lot like an outsize Martin 00-15 (or 00-17), with lots of woody warmth and a plain, forward sound. 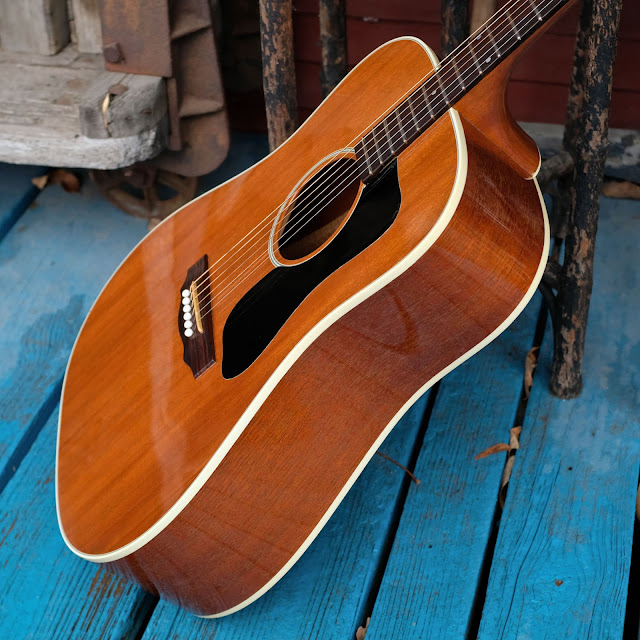 This checks those boxes and the long scale definitely pushes a lot of its sound right out front. 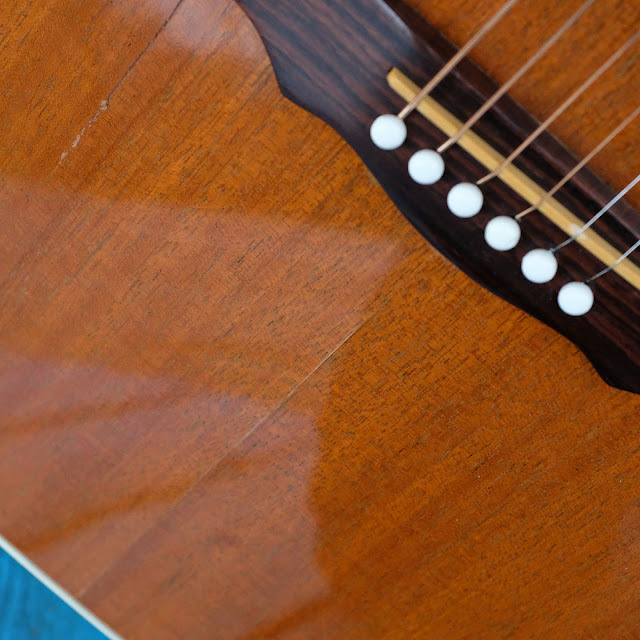 It's a lot of fun for fill and lead work because of that, but bang-on strumming sounds just as good. 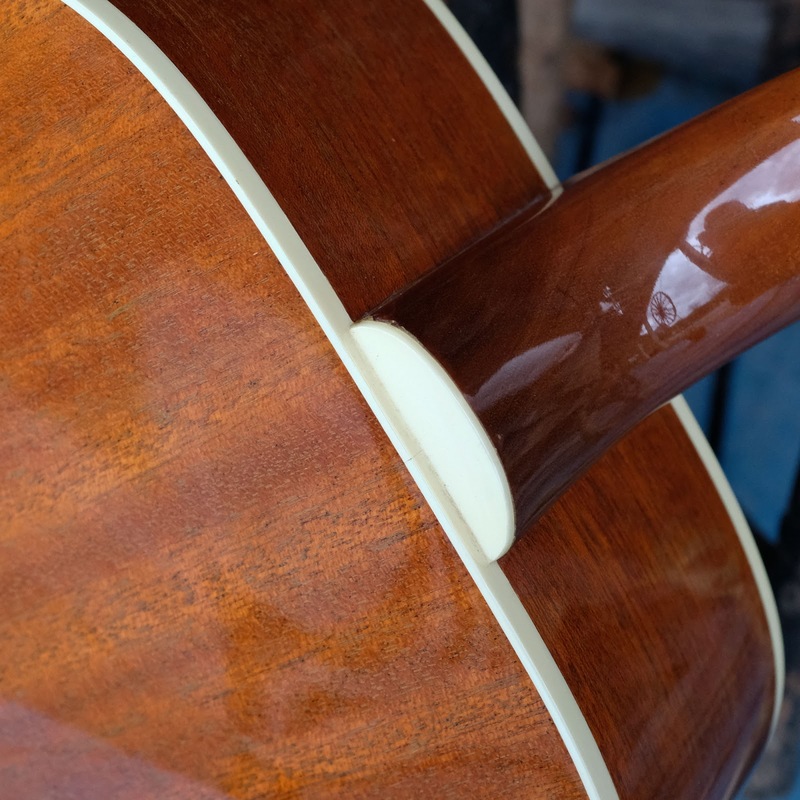 A customer of mine sent this in for consignment and it's a quite-clean guitar save for a couple of repaired hairline cracks in the top and a little finish-cracking around the nut. 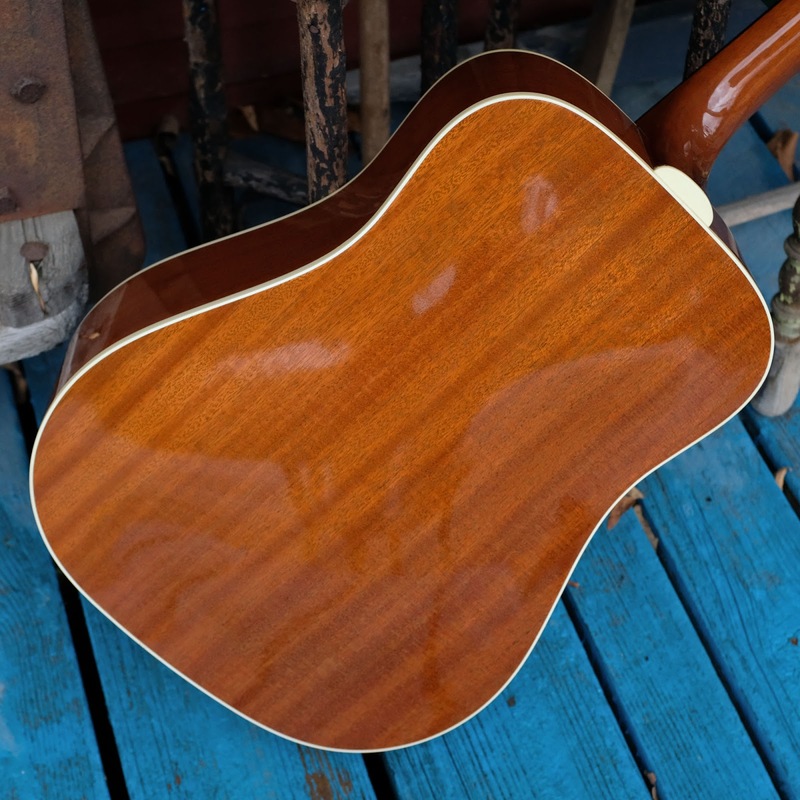 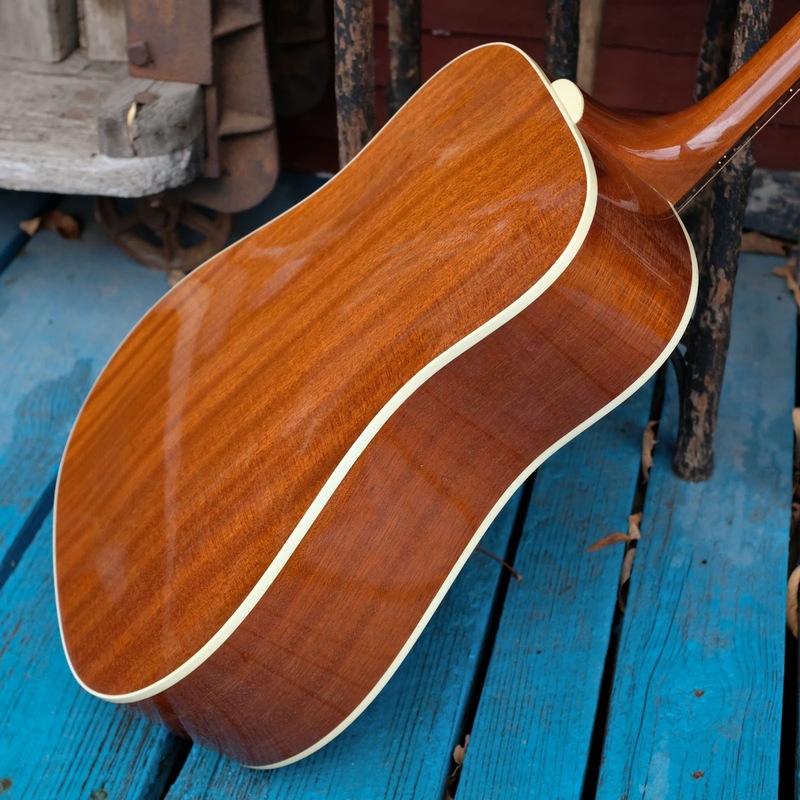 The finish is glossy and pretty, the neck is slim and fast like a modern electric, and it seems to be a very stable guitar as it hasn't had a neck reset and the saddle is still nice and tall and the neck is straight and good to go. Specs are: 25 1/2" scale length, 1 5/8" nut width, 1 3/8" string spacing at the nut, 2 1/8" spacing at the bridge, 15 3/4" lower bout, 11 1/2" upper bout, and 5 1/8" side depth at the endblock. 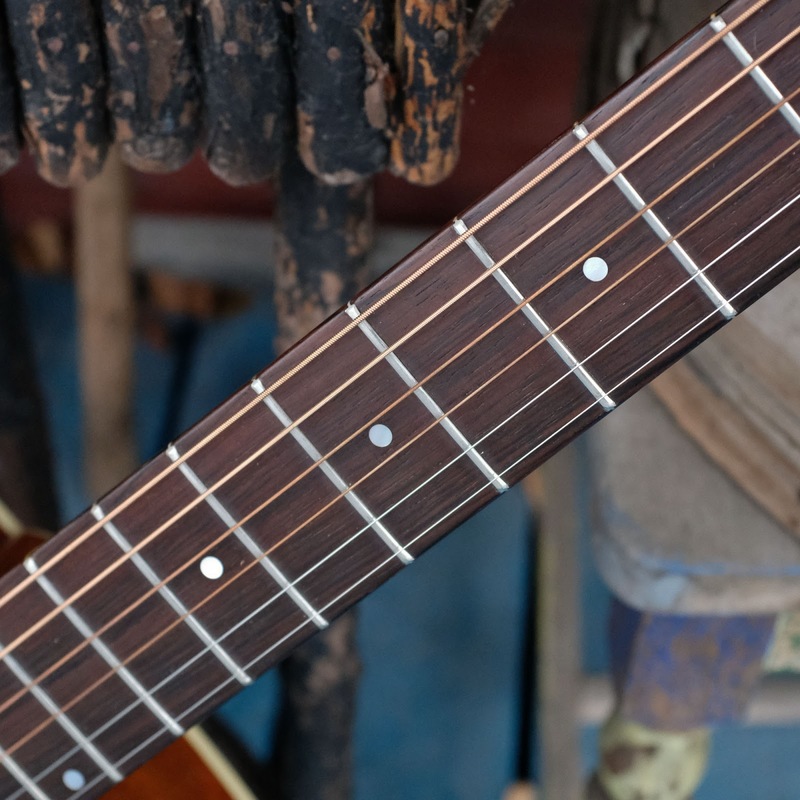 Action is spot-on at 3/32" EA and 1/16" DGBE at the 12th fret and it's wearing 54w-12 gauges. 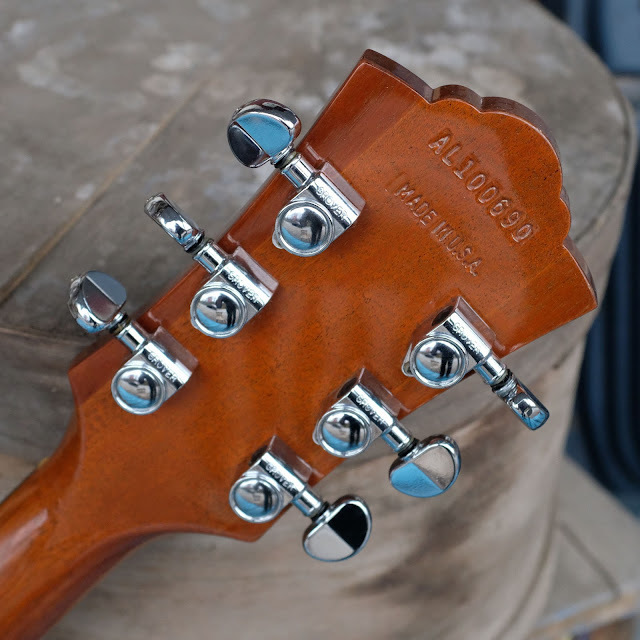 The neck has a very slim, electric-style C-shape to its rear and a ~14" radius to the board. 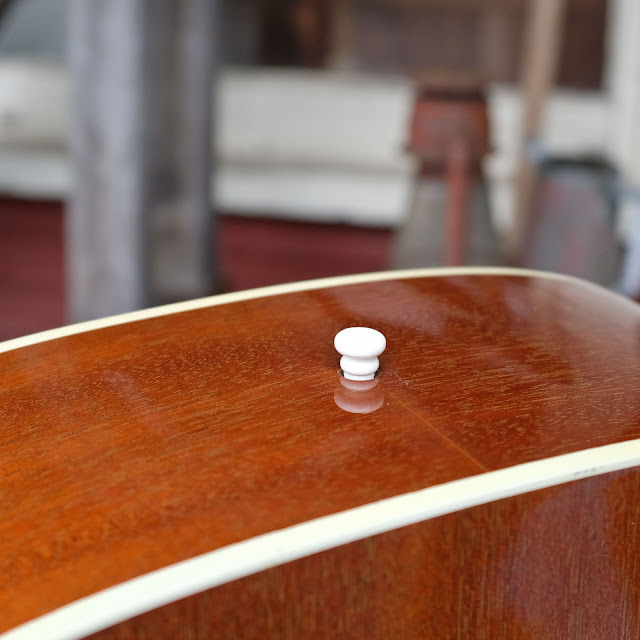 Materials are: solid mahogany top, mahogany back and sides, and ply+arched mahogany back. 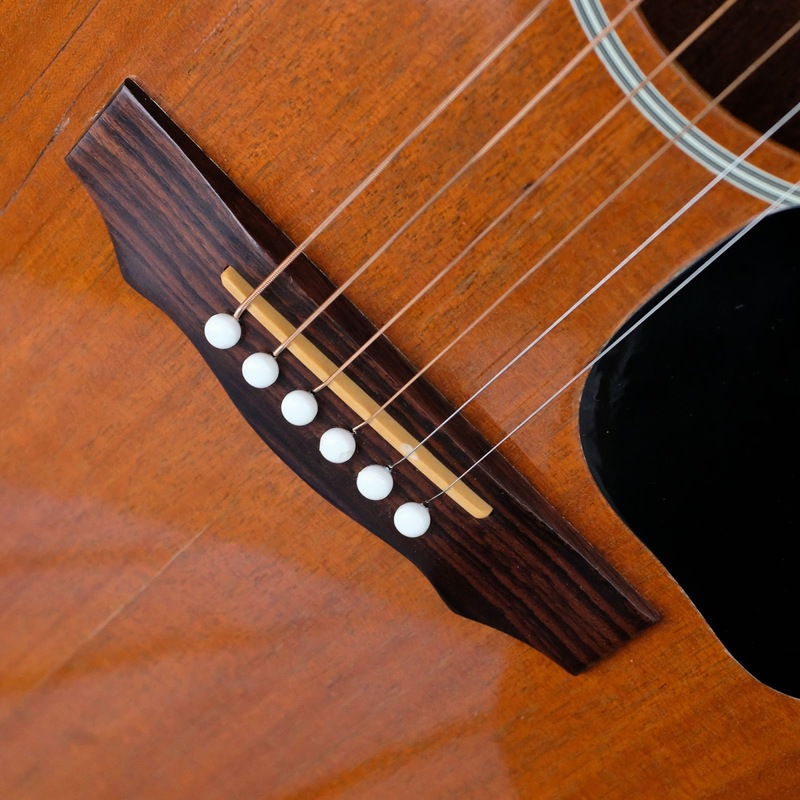 The neck is mahogany and the board and bridge are rosewood. 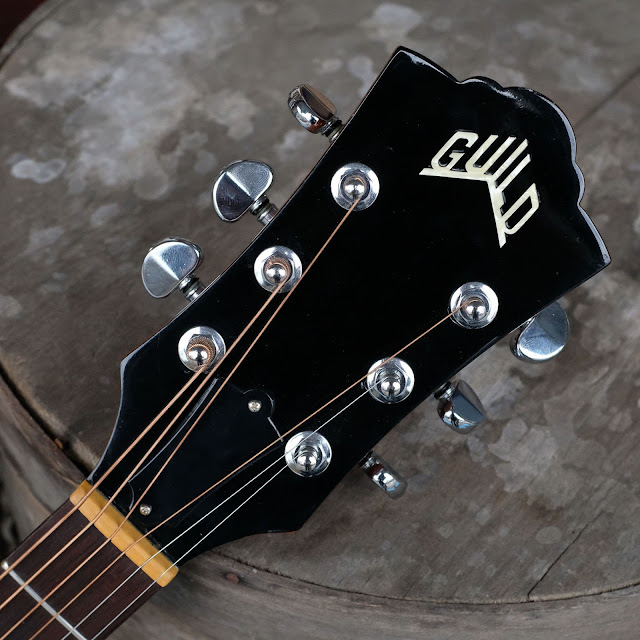 There's multi-ply white binding on the back and top edges and it sports a black pickguard. 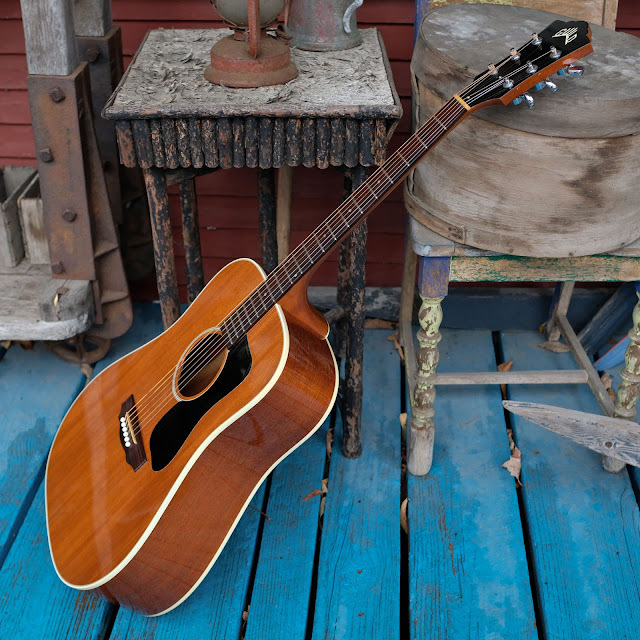 It appears to be all-original, too, down to the pins. 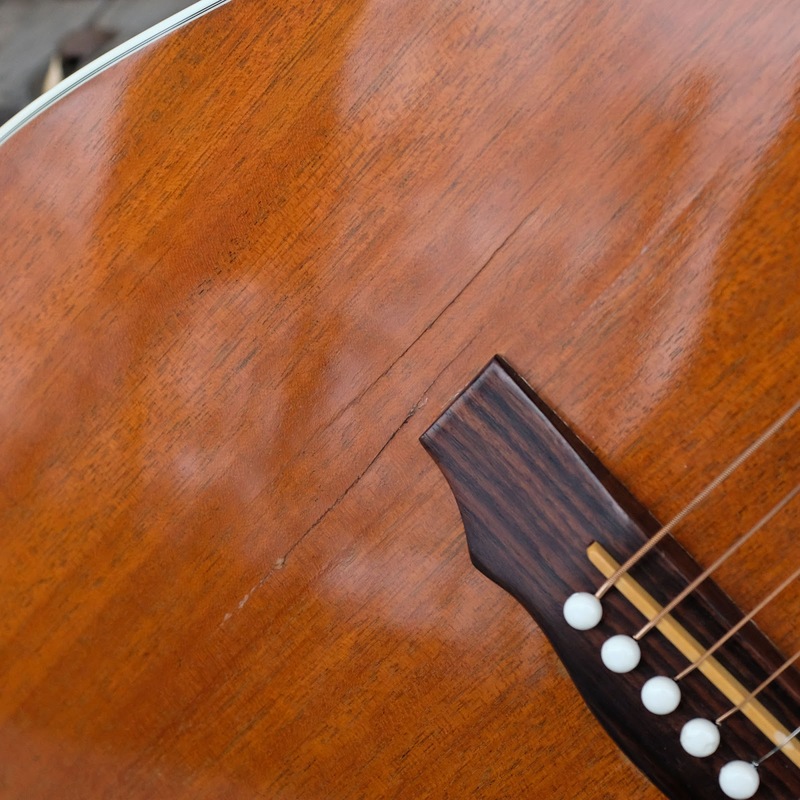 Condition issues: there are two repaired hairline cracks to the bass-side of the bridge on the top and the center seam below the bridge was cleated at some point in the past. Work included: a fret level/dress, repair to the two top cracks (cleats and fill), a reglue of a tonebar brace, and general setup. 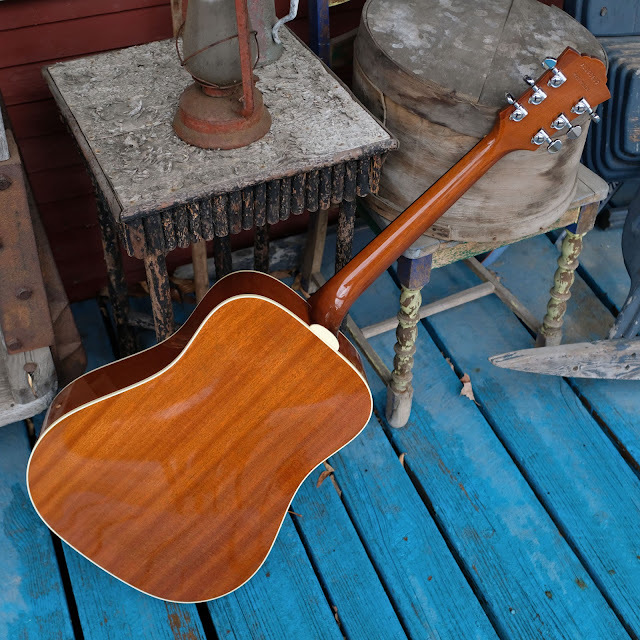 It's ready to go and plays on-the-dot. It comes with: a presumably-original, good-quality, hard case. The saddle only needed a little compensation for the B-string slot but was otherwise good to go. I tried to get some ugly glare on the hairline cracks on the top to show them off. 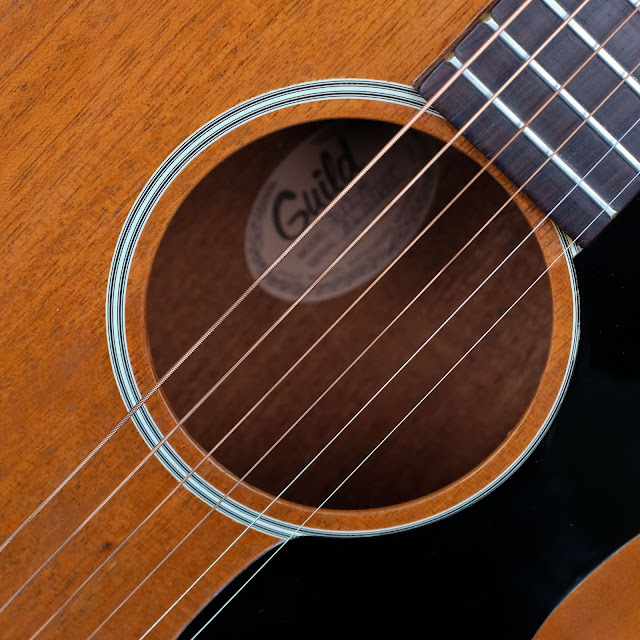 They're nowhere near so obvious when you're playing/looking at the guitar, but I wanted to be sure folks knew where they were. They're sealed and cleated from behind.